The wedding of Shara + Ross blended a sense of tradition with a clean and modern aesthetic. The couple wanted a traditional Catholic ceremony with a celebration for 220 of their family and friends at their home, immediately following the ceremony. 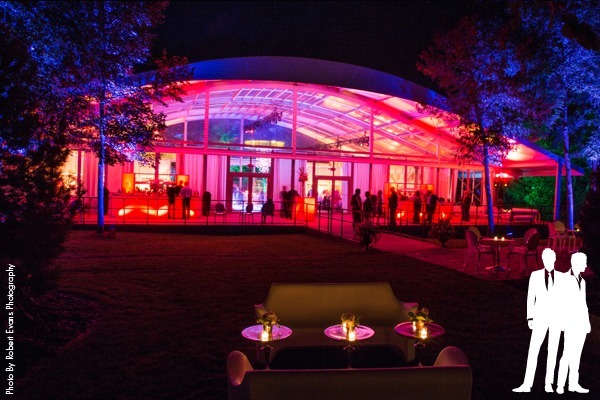 Our task would be to create a magical experience for their guests, by taking over their front lawn to create a reception space unlike anything anyone had ever seen before. 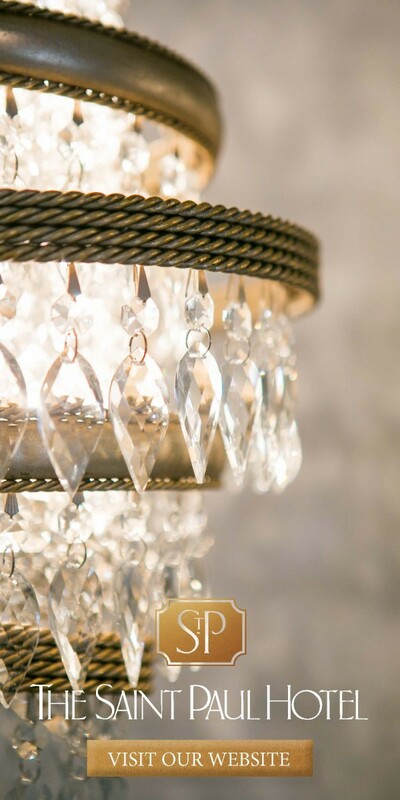 Ensuring etiquette and elegance was the prevailing inspiration for the wedding, and that great food and entertainment was central to the celebration, we created signature moments for guests to remember. 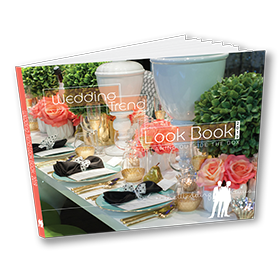 Above all, the couple wanted to make sure fun and delight was abound for all the guests. 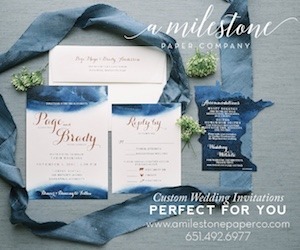 It all started with the invitations and the “H” laurel wreath, which would encompass the overall inspiring direction. Gold, ivory and blush became the color palette for the day, blossoming in fresh Hydrangeas, Bianca Roses, Gladiolas, Queen Anne’s Lace, Sahara Roses and Tibet Roses along with lush greenery. We brought in the light blue and blush of the hydrangea in the Monique Lhuillier china for the dinner, while the contemporary hammered metal flatware and beautiful crystal stemware, rounded out the more formal aspect of the evening. 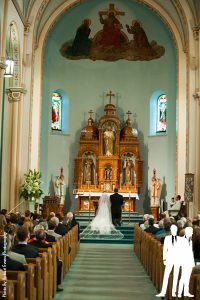 We are rarely asked to design a traditional styled wedding. 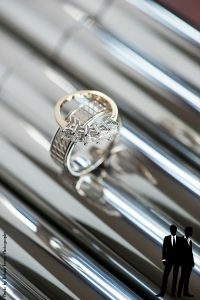 This wedding was an exciting treat that would include as much focus on the ceremony, as it would on the reception. We loved the fact that the ceremony would take place in a historic church built in 1900, with Romanesque style and beautiful classical lines. 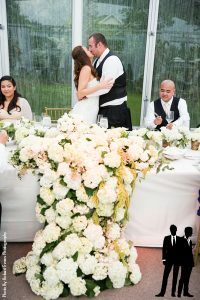 Our design enhanced the church with a beautiful floral arrangement when guests arrived and one large pedestal arrangement statement piece to enhance the altar area. The first surprise of the day came in the form of voices. 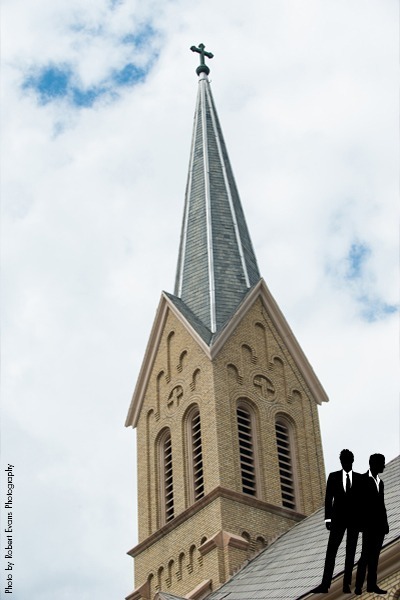 We received dispensation to bring the Choir of the Basilica of St. Mary as a surprise for the groom’s mother who supported the church’s music ministry. 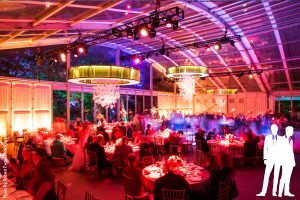 The signature element for this wedding would be the 66 foot by 100 foot Arcum structure with glass walls and a clear arched ceiling. The structure sat prominently at the top of the winding drive, nestled perfectly in the forest of trees that outlined the front lawn. Inside we set a combination of long harvest tables along the perimeter, and round tables surrounding the LED dance floor. Above, we hung oversized chandeliers, each with a waterfall of glass balls. 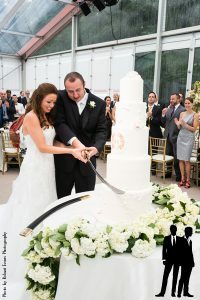 As a light passing shower created a rainbow over the home, guests were ushered into the unveiled clear custom tent structure for dinner with the five-foot-tall wedding cake and Lebanese sword prominently displayed. 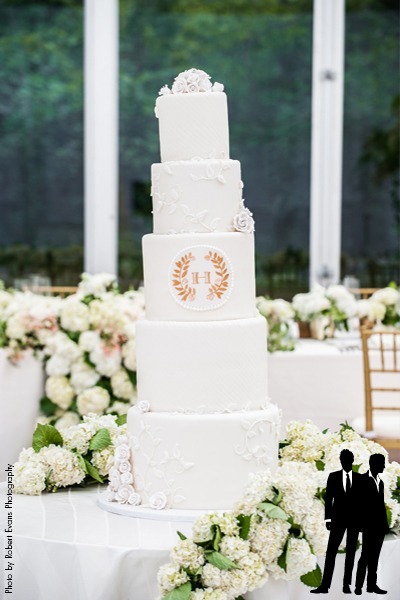 The cake was surrounded by a cascading floral garland placed center stage on the lit dance floor. As the formal cocktail hour began with guests surrounding the custom made acrylic bars, butlers passed more robust hors d’oeuvres such as “Spaghetti and Meatballs”, Crispy Arancini, Beef Carpaccio and Caprese skewers. 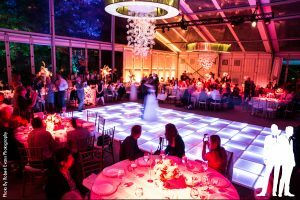 Key elements for the wedding included – amazing food with a six course custom dinner menu, executed by a staff of ten chefs artistically presenting each course! 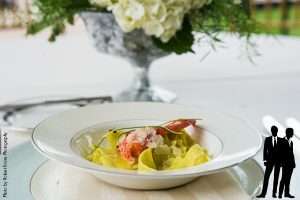 The dinner menu was designed with the couples favorite cuisine starting with the first course of King Crab & Avocado Salad, followed by Lobster Pappardelle an English pea crema, smoked Reggiano and one Maine Lobster claw. The salad course featured frisee and baby arugula, smoked paprika cheese, and drizzled orange vinaigrette, all featured on top of a vibrant colored watermelon radish. 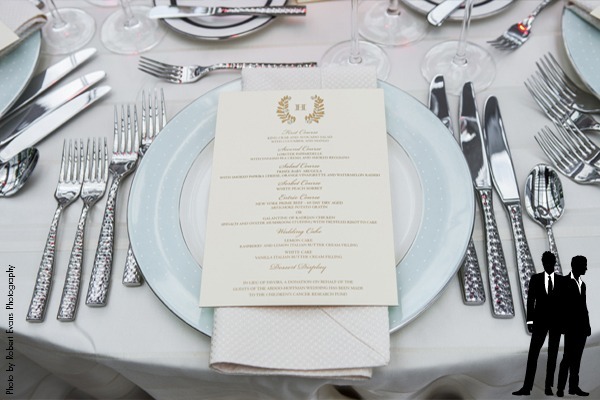 The White Peach Sorbet cleansed the palate for the main entrée of either a grilled 60-Day Dry Aged New York of Prime Beef – or Galantine of Kadejan Chicken with spinach and oyster mushroom stuffing. 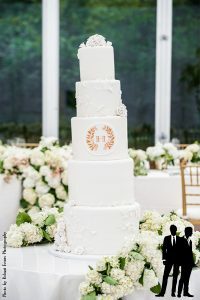 The PIÈCE DE RÉSISTANCE was the wedding cake in tiers of alternating flavors. The first tier featured lemon cake with raspberry filling and lemon Italian butter cream. The second featured white cake with vanilla Italian butter cream icing. The top tier was chocolate cake with Italian butter cream filling and icing. The final surprise of the evening was the Lebanese Dance Troupe, which was a gift to the bride and guests from the groom, allowing everyone to delight in the bride’s heritage. 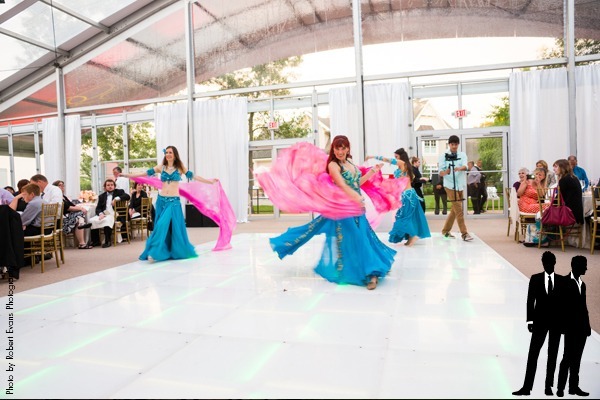 The guests had so much fun, they were up on the dance floor dancing with the troupe.